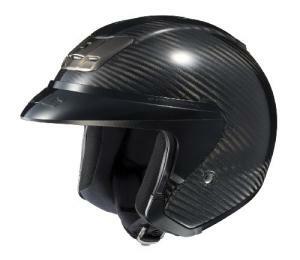 HJC's A-3 Carbon Fiber Open Face helmet is their cream-of-the-crop open face helmet. The AC-3 is made from a carbon fiber composite weave shell. Carbon fiber is pretty much the lightest and strongest thing on the planet. So, naturally, helmets made of the stuff are really light and really strong. The AC-3 is no different, and as far at open face helmets go, it's pretty easy on the eyes. Inside the helmet is a removable and washable liner made from moisture-wicking, anti-bacterial padding. HJC says this lid has its 4th generation Advanced Channeling Ventilation System, but keeping your head cool is not really a problem as half your face is exposed anyway. Speaking of exposure, an open face helmet may offer better protection than a half-helmet, but all the carbon fiber in the world won't mean anything if you crash and land on your face. Just keep that in mind when shopping around.